Product Catalog > Product Catalog > Bags & Storage > #FB3 - Flat Mesh Bag 15"x20"
These make great totes for your collection of cam buckle straps. 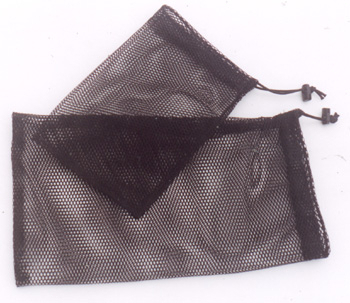 We offer six sizes of flat mesh drawstring bags. They are an easy way to carry wet gear to, from, and on the water. The small mesh keeps small items in while still letting water out.